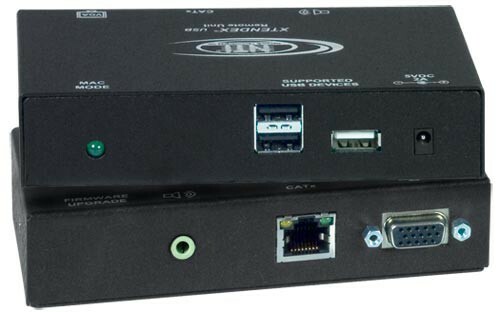 The VOPEX® VGA USB KVM Splitter/Extender allows up to eight remote users (8 USB keyboards, mice, and VGA monitors) to access one USB computer (PC, SUN, MAC) located up to 1,000 feet away using CAT5/5e/6 cable. Audio can be broadcasted to self-powered stereo speakers at the local unit and each remote location. 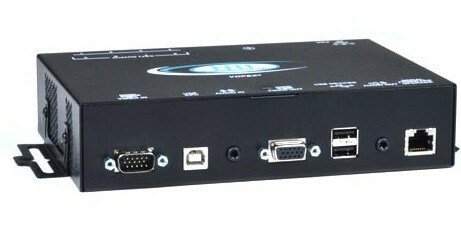 The VOPEX VGA USB KVM Splitter/Extender system has two components: the VOPEX-C5USBVA-x broadcast unit, which connects to a computer and provides local keyboard, monitor and mouse connections; and an XTENDEX® remote unit (ST-C5USBV(U/A/UA)-R-1000S) for each remote monitor, keyboard, and mouse. The units are interconnected by CAT5/5e/6 cable. One female 3.5mm stereo audio connector (audio in). Must use remote units with additional USB port (ST-C5USBVU-R-1000S or ST-C5USBVUA-R-1000S). One 3.5mm stereo audio plug (audio out). Maximum I/O levels for audio: 3.1vp-p (line level). 1-meter (3.28 ft) USB Type A male to Type B male cable included. 5-foot CAT5 patch cable and DB9F-RJ45F adapter included for firmware upgrade. Use CAT5/5e/6 solid UTP/STP straight through cable for TIA/EIA-568B wiring terminated with standard Rj45 connectors (not included). 110 to 220 VAC at 50 or 60 Hz via AC adapter. (Country-specific AC adapter included). 4-Port: 7.35x5.0x1.09 in (187x127x28 mm). 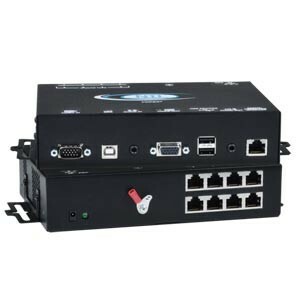 8-Port: 7.35x5.0x1.7 in (187x127x43 mm). Supports resolutions to 2048x1536; refer to the resolution chart below for resolutions at different lengths. Maximum output level of video: 1.45Vp-p. Available with optional female USB Type A connector for an additional USB 2.0 (low/full speed) device - USB touch screen monitor, CAC card reader, interactive whiteboard, or barcode scanner. Supported touch screen monitors: Microtouch 3M, Elo 1529L 3000 Series, Elo 1515L, Smart Podium ID422w, Hope Industrial HIS-RL17, NEC MultiSync E222W, Industrial Electronic Devices Inc IWS-240t-G3, Zytronics CML-170, Pulse IR TSV4001/DT40, HP Compaq, Sharp Aquos Board, Advantech FPM-2150, Touch Screens Inc TWAP-1150ADP/1154ADP-USB and similar monitors that use PenMount 5000/6000/9000 driver.